It has been “partly cloudy” here (meaning frequent rain and hardly any sun, as I noted earlier), and I’ve had a job waiting for sunshine. The folks who distribute Birdy Bikes in the US are going to take out an ad in Airstream Life magazine in the Fall and I promised I’d take a photo of the bikes next to our Airstream. Yesterday the sun came out in the afternoon and Eleanor and I ran out to capture some photos. You may see one of them in the magazine (minus Eleanor’s hand, which you can spot at left in some of the photos). Eleanor was willing to “model” with the bikes but then she’d probably send me a bill. Everyone is having fun except me and Eleanor. We are still trying to close up 1,001 loose ends with cars and other possessions. Emma and her grandparents went out to Pizza Putt last night, which is sort of a Chuckie Cheese with mini-golf — a major attraction for the sporting 6-year-old. I stayed behind and worked. I am working on a book project, in addition to the Fall magazine. As a result my life is 12-15 hours a day in front of the laptop … not exciting. I only mention this because I still often get comments from people that I don’t work and am on some sort of endless vacation. The book, when published later this fall, will help explain how working couples can do what we are doing. I think once people start to recognize that today’s technology makes it possible for many people to travel extensively before retirement, that stigma of “you don’t do any work” will go away. Another setback on the car front: the Nissan dealer didn’t inspect the car when we had it in for the 30,000 mile service on Monday. So we brought it back yesterday to get the sticker, and discovered it can’t pass — the exhaust manifold is cracked! That’s an expensive job, fortunately under warranty. I’m wondering if we shouldn’t consider an extended warranty now, since our new-car warranty will run out in 6,000 miles. The dealer can’t get the replacement manifold this week, and we are leaving for Maine on Friday. It will have to get fixed when we return on the 12th. In the meantime, we are carrying a letter from the dealership which explains we have an appointment to get it fixed but couldn’t get the part before the inspection runs out. I am hoping we won’t need to use that letter. 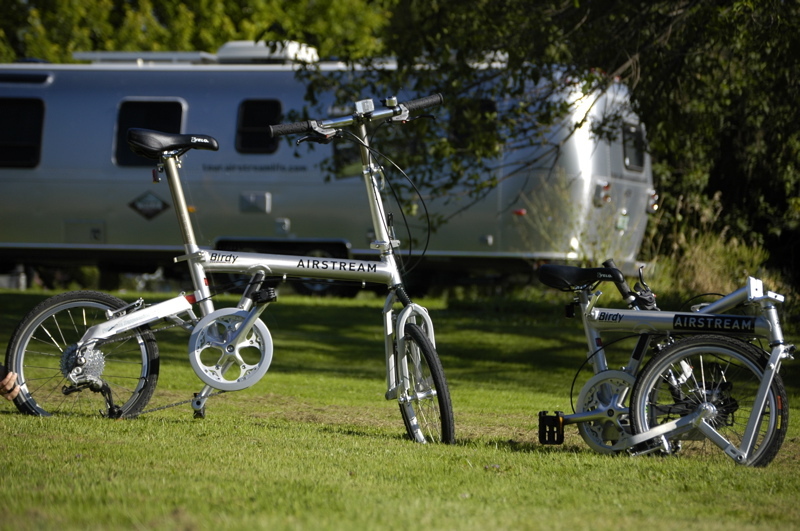 Some of our blog readers have questioned whether we are doing maintenance on the Airstream as well as the cars. The answer is that we aren’t doing much right now, because we do it as we go. As full-timers we don’t often have the opportunity to stop and do a big maintenance session, and we don’t have the luxury of holding off on things until it is convenient. So we do what we can when we can. The wheel bearings were re-packed when we did the disc brake conversion in March. Our tires and wheels have seen plenty of maintenance lately (I hate to even think about it!) In general, the running gear is in good shape. We usually clean things inside and out as we see the need. For example, I cleaned the exterior refrigerator compartment just a few weeks ago, when I noticed it was getting filled with dust and crud. Today Jay & Cherie suggested checking the water heater for mineral deposits, which is a good idea. We’ve never drained it, since we never winterize the trailer. I’m hoping the water filter we put on our incoming water line has kept the minerals to a minimum. Ditto for lubing the locks and latches. I keep several kinds of lube in my tool bag: grease, Reese hitch lube, silicone-based liquid lubricant, and liquid graphite. The latter two are good for locks, latches, and hinges. I lubed the hitch ball (which is hidden under the Hensley hitch all the time) just a couple of weeks ago a a rest stop in New York. It’s a messy job that needs to be done every few months if you full-time, or perhaps annually if you don’t. While I was at it, I took the opportunity to check all the bolts and pins on the hitch. These sorts of items go hand-in-hand with a good general check everytime we hitch up. As you know, I now check all the lug nuts and tire pressures as part of the pre-departure checklist. Pilots of aircraft do a “walk-around” check before takeoff, and I do the same thing. I look for open windows or vents, things that are loose or hanging, obstacles under the trailer, drips from unexpected places, tire damage, etc. In general, everything should be clean, tight, and dry. The Honda Prelude has been condemned by the inspector. The rust is worse than we thought. A portion of the underbody frame collapsed when the car was put on the lift. It won’t pass inspection without at least $1k worth of work, and then it will need more (timing belt, etc) very soon. We are going to put it out to pasture and find another car for economical local commuting next summer. … what bugs me about Vermont. It’s a lovely place and you should come visit — really! — but the weather is always a crapshoot. Today, more gray and drizzle, but at least it’s not cold. I remember in Big Bend when the opposite occurred. There, “10% chance of rain” was their hopeful phrase. They said that every day when we were there in February, and we never even saw a cloud the entire time. Yesterday we got the big service on the Nissan. At 30,000 miles an expensive service interval comes up: automatic transmission flush, coolant flush, oil change, rear differential fluid change, engine belts, numerous systems checks, and many small part replacements (radiator cap, distributor cap, rotor, spark plugs, engine air filter, fuel filter, wiper blades, cabin microfilter) Some of these items only apply when you’ve been towing, as we have. We just put new tires on last Thursday, also. Between the tires and the 30,000 mile service, the total is over $1100. It’s a hard bill to swallow, but our experience has shown us that preventative maintenance is absolutely essential, given all the miles and desolate areas we travel through. I talked to Bert about it over dinner on Sunday night and he felt the same way. “We maintain the heck out of that truck!” were Bert’s words — but when you roam the country for months on end, utterly dependent on one vehicle, it doesn’t seem like skimping on maintenance is a wise idea. Today our local car (an elderly Honda Prelude) is in the shop for its inspection. The poor thing is 15 years old, burns a quart of oil every 500 miles, has a tough case of rust along the passenger-side rocker panel, 144k miles on the clock, and it is due for an expensive timing belt replacement and an exhaust pipe. Every year at inspection time we consider whether to fix it again or push it off a cliff. But despite its flaws it runs beautifully, gets great gas mileage, and is a lot of fun to drive. I haven’t seen much on the market that can compare under $16,000 (new). Eleanor says if it were a vintage Airstream I wouldn’t hesitate to dump $10k into it to restore it and keep it on the road. I suppose that’s true, but a 1991 model is not vintage, either. It’s just a cool sporty car that I could probably replace for $2000 with a rust-free one from the south. So today is decision day … we’ll know more when the garage calls and tells us what is needed to get it to pass Inspection. Where was the Cat in the Hat? Rain, rain, rain. Yesterday I woke up to the sound of rain pelting our aluminum roof. It was one of those endless Sundays of clouds, wind, rain, and cold, which Vermont can get any time of year. We couldn’t do much outside. We couldn’t get rid of stuff from storage (because the drop-off places were all closed). So we all whittled away at the day the best we could. It was a dull, dull day. With the dense clouds, our solar panels were only able to make 6 amp-hours all day. That’s the worst performance we’ve had since we were in the dark Redwood forest in California. Normally they generate 40-55 amp-hours this time of year. It’s not a problem because our battery bank can easily cover us for a few days. In the evening we met Bert & Janie for Italian dinner at Papa Frank’s. They are leaving today for Quebec City. We’ve come to realize that our schedules may align again in October as we are heading down the east coast, so with luck we’ll be able to travel with them again to Philadelphia, Shenandoah National Park, Great Smokies National Park, and Cumberland National Seashore. This will change our plans but for the better, I think. It’s too bad Bert and Janie are on a schedule. They need to be in Quebec City soon so they can finish some research there, head to Maine, hike Mt Katahdin, then drive through New Brunswick to Nova Scotia, explore the entire Evangeline Trail and Cape Breton and somehow make it back to Maine before mid-October. That’s a lot of driving, exploring, and research, and in the midst of it they need to be working on their various book, magazine, and photo assignments. So today Janie stayed in to proof galleys of an upcoming book, while I took Bert around town to show him some of the highlights of Burlington. 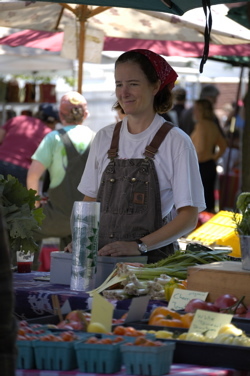 One of the simple pleasures of Vermont is the Saturday Farmer’s Market. They are held all over the state. In Burlington, our “Queen City”, it was in the City Park. The diversity of food was impressive. I bought some terrific blue gorgonzola from a local farm. We ate most of it before dinner — one of the best blues I’ve ever had. Too bad we can only buy it at the local stores. 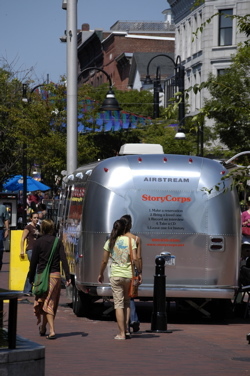 The “Storycorps” Airstream has been parked in the Church Street Marketplace for a while. Next week it heads to Portland, ME. Bert and I checked it out — a 2005 Airstream International 25 shell, with an extra large door to the left of the main door (for handicapped access) and very few windows. GVWR is shown as 7500 lbs. A friend has been encouraging us to go in and tell our story … We’re considering it. Maybe in Maine. Rich interviews the Storycorps interviewer. Photo by Bert Gildart. Emma spent the afternoon on the lake with her Uncle Steve, getting towed around behind the Boston Whaler on an inflatable donut. I hope to be able to post pictures of this later, when I get them out of Eleanor’s camera. 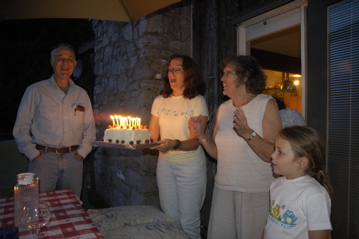 This evening we gathered for dinner on the deck again, and afterward Eleanor brought out a cake she made today: yellow cake with lemon curd filling and butter cream frosting. Excellent! Everyone sang Happy Birthday for me and Janie, since we both had birthdays this month. 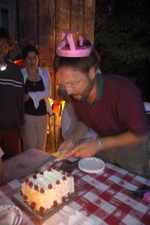 Emma made me a paper crown to wear, and my parents gave Eleanor and I a gift of dinner at a new local restaurant. 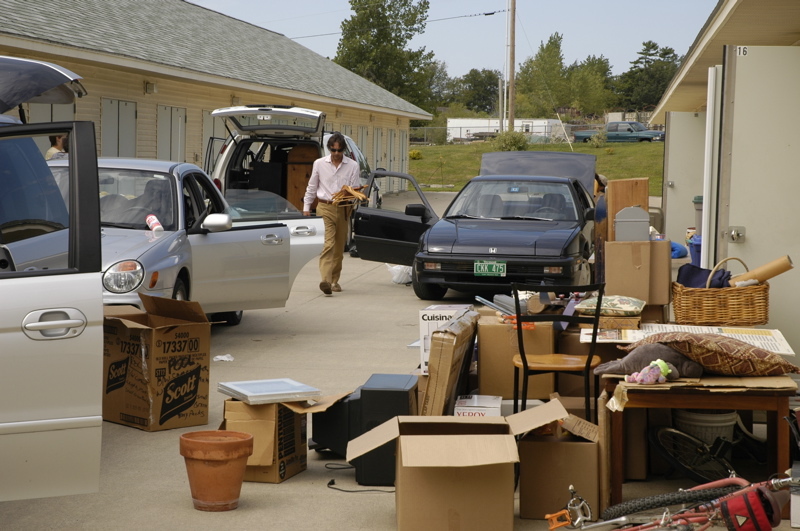 We can see that getting rid of things in storage will be a multiple-step process. Today we made progress, but it will take several long days to even dent the belongings that own us. The eBay seller was first in line today, at 10 a.m. He picked up a dozen items. Then we started loading stuff into a minivan to take to the “waste transfer station” (what we used to call the dump). My brother and one of his business associates showed up to take some office furniture and miscellaneous. We have a lot of miscellaneous, so there was plenty to go around. Eleanor sorted out dozens of boxes of outgrown kid clothing, housewares, and toys to be donated or given away. I identified boxes of ancient files (cancelled checks from 1992, stories I wrote but never finished in 1989, etc) and put them in a pile to be burned on the beach next week. Four or five boxes of paperbacks will be donated to rummage sales or local used-book stores. We’ll keep a handful for book exchanges at the campgrounds we go to. Then we hauled the antiques to an auction house, packed the remaining stuff away, and vowed to return again. Next week we plan to hold an open house for our friends. Anything they want, except the furniture, is free if they take it away on the spot. Bert & Janie Gildart showed up this evening in their Airstream Safari 28. They’re parked up in Shelburne, the next town north. 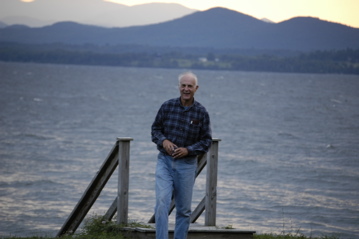 They joined us for dinner on the deck, overlooking Lake Champlain. My brother and a couple of his friends also showed up, and listened to us swap stories of the great national parks of the west. Bert and Janie have some incredible stories about their travels. I grilled hamburgers, Emma helped to shuck corn on the cob, Janie brought salad, and Eleanor prepared everything in the kitchen. After dinner, we sat by the table and had ice cream over blueberry coffee cake, and peeked at Jupiter and four moons through the telescope. It was superb evening … one we hope to repeat again tomorrow night. I’m also experimenting with another possible feature of this blog. If you’ve heard of Google Earth but haven’t tried it, get a copy soon. It’s really spectacular. You will need broadband Internet and a recent-model computer to use it, however. Download our current parking location here! If you have Google Earth, opening this file should allow you to instantly “fly” right to a view of our parking spot! Very geeky … and fun! Now, keep in mind this is just an experiment. I won’t be able to do this every day because I won’t always have broadband Internet (Google Earth won’t work without it). But, if you like it, I’ll try to post some of our more interesting camping locations. 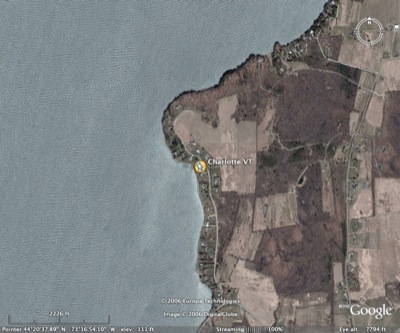 Another thing to keep in mind is that the satellite imagery you’ll see on Google Earth is not real-time. So you won’t see our Airstream. In fact, the image for today’s parking spot appears to be at least 15-20 years old. The road has been paved since this image was taken. But, it’s good enough for a general idea of the setting. Try it out and let me know how it works, OK? Thanks!